Have you ever watched a Chinese martial arts demonstration and been astounded or astonished by seeing a small man use a touch to effortlessly toss a large man across the room with seemingly little or no effort? What most people do not realize is that the ability that they have just witnessed is known as Fa Jing which translates into English as explosive force. Most Chinese internal arts have one or more versions of Fa Jing and Tai Chi Fa Jing training is a body of study within Tai Chi. Basic Fa Jing issuing of power or energy requires proper mechanical and physical principles to work. This includes but is not limited to a very proper connected alignment through the body of the practitioner. Proper alignment begins with the Wu Chi standing posture and continues to be practiced when the Tai Chi practitioner performs the Tai Chi moves. If there is a break in the physical or energetic structure of the Tai Chi practitioner then it is highly unlikely that Fa Jing can be issued. The Fa Jing practitioner also needs to have some understanding of alignment and structure in others to be able to find and affect their center of gravity. This involves being able to feel and ideally see the other person’s structure, alignment and weight distribution in order to affect it. If the Fa Jing practitioner is more advanced then they are able to do less physical movement and yet still obtain an explosive result against someone who is in a stronger position. 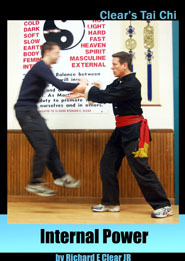 The most impressive, and of course famous Fa Jing demonstrations are when a Fa Jing practitioner barely moves or doesn’t physically move at all and the surprised recipient is suddenly bounced several feet up into the air or thrown at least 6 feet or more away. Of course when Fa Jing is performed by an advanced practitioner the explosive energy transfer can be directed so that the result is much less dramatic to watch but much more serious to the person receiving the energy. Outwardly it appears like much less but the recipient feels it much much more. If the energy is directed into the insides of the person being struck or into one of their internal organs then the results can be devastating. This, of course, is a high level internal strike which is a Dim Mak application of Fa Jing. Check out our 10 Minute Guide to Clear’s Internal Power Training. bigger persons with a soft touch, isn’t it a trick or something? This skill is uncommon however there many people all over the world who can do it.